January is National Thank You Month, which makes it the perfect time to show your appreciation for your loyal customers and valued employees. You can distribute unique promotional products and personalized business gifts throughout the month to say thanks. Recognition programs are usually appreciated by clients and staffers. Fox Business notes that small presents can improve customer satisfaction and lead to positive reviews. Additionally, gifts can improve your relationships with your workers so it’s easier to retain your best employees. However, you shouldn’t distribute the same items to both parties, and you must ensure that your Thank You Month rewards include a personal touch. Fox Business recommends creating different categories for your customer recognition programs. The news source writes that you can divide your clients into groups based on criteria like purchase histories and loyalty. The simplest strategy for developing a categorical system is distributing unique promotional gifts to each set of customers. Give smaller items to new clients. Branded items like pens aren’t extravagant, but they’re appreciated. In fact, the Advertising Speciality Institute (ASI) recently found that writing utensils are the most popular promotional marketing products among American consumers. Loyal customers should receive larger gifts. Tote bags and mugs are functional and fun presents that aren’t overly personal, so you don’t have to worry about alienating your clients. 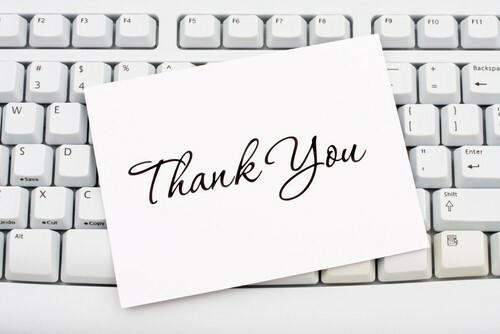 You can use National Thank You Month to launch a regular employee recognition program. Regular appreciation from managers is a huge component to overall workplace satisfaction. In its spring survey, Globoforce found that 81 percent of employees are happier with their current positions when they’re recognized for their efforts. Additionally, only 23 percent of workers who received some acknowledgement in the last year planned on seeking new jobs. Similar to your customer reward program, you don’t want to distribute gifts that will alienate your employees. To avoid over-familiarity, give out items that are useful in the workplace, but customize the presents for every staffer. For instance, personalized calendars and custom pens have functionality around the office and are more sentimental than generic gifts. Additionally, the tools can be used every day so your employees will always be reminded that you recognize their excellent work. National Thank You Month may be one of the most important times of the year. Promotional gifts and saying thanks can help you start 2013 off on the right foot and reach new levels of success.